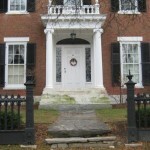 The “Eddy House” as it is fondly called, located on South Main Street in Middlebury, VT is a brick Federal Style house. In 1998, the house was in need of a thorough renovation. 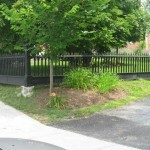 In one of the extensive stone basement rooms lay several thousand pieces of the original black cast iron and wood fencing that had surrounded the front of the property in the 1870s, taken down in the 1980s due to neglect and vandalism. 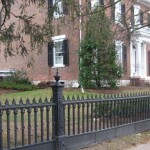 The fence originated from the Victorian era; through meticulous and painstaking repair work and reconstruction with the help of a local welder, the fence experienced a new life surrounding the original Federal style brick 1830s house in downtown Middlebury, VT. 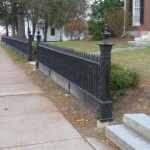 The historical renovation work of this fence has received much public attention and contributed to the historical and cultural enrichment of downtown Main Street, Middlebury, VT.